Namarupas means name (nama) and form (rupa) in the Pali language. This term is used in Buddhism to refer to the constituent processes of the human being- namely the Five Aggregates. 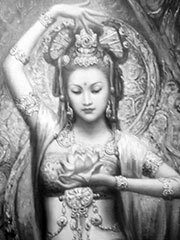 Nama is typically considered to refer to the psychological elements of the human person, while rupa refers to the physical. In keeping with the doctrine of anatta (Sanskrit: anatman), or the absence of an enduring essential self, nama and rupa are held to be constantly in a state of flux, with only the continuity of experience (itself a product of dependent origination) providing an experience of any sort of conventional ‘self’. The term namarupa is also used in Hindu thought, nama describing the spiritual or essential properties of an object or being, and rupa the physical presence that it manifests. These terms are used similarly to the way that ‘essence’ and ‘accidence’ are used in Catholic theology to describe transubstantiation. The distinction between nama and rupa in Hindu thought explains the ability of spiritual powers to manifest through inadequate or inanimate vessels- as observed in possession and oracular phenomena, as well as in the presence of the divine in images that are worshiped through puja. In contrast, the Buddhist nama and rupa are mutually dependent, and not separable.